When you immerse yourself in the work of Lala Abaddon, the future looks a dreamlike reality. She believes that life is for the now, and has decided to use her work to create beauty out of horror and to find strength from the pain and complexities of life. 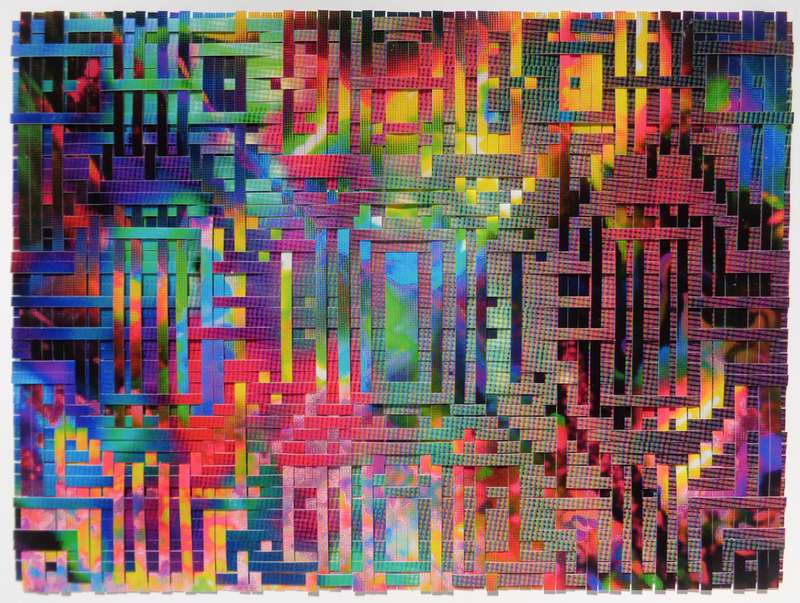 She delved deep into the constructs of weaving, painting and photography and attempt to disrupt the constructs of convention through the use of color and contrast to create space and time within a stationary moment. 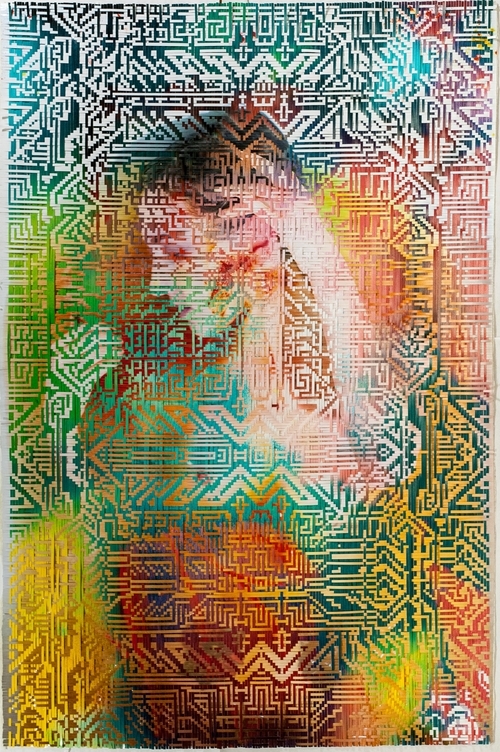 One year after Fractal Realities, her first solo exhibition at Castor Gallery, future looks exciting for this young Brooklyn based artist that will end the year with a big solo show in Denver Colorado in December 2016. Her woven work, made with traditional analog photographic methods, weave emotions together, with a strong personality. 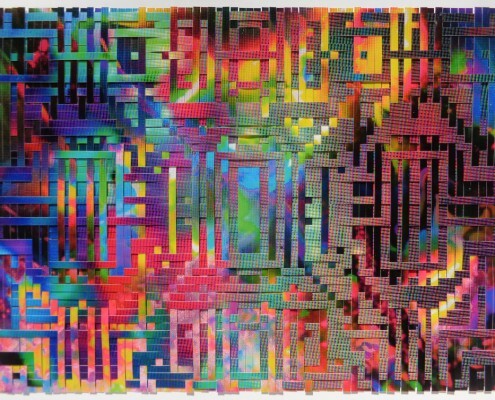 Capturing image sequences in 35mm film, she arranges it into precise and deliberate pairings, then cuts them into strips and hand-weave the prints with undulating and complicated patterns creating these unique pieces where chaos merges with order. Construction and deconstruction come together to show simultaneous realities. Lala´s work is a mirror to the complexity of the ongoing transformation process that humans are involved. 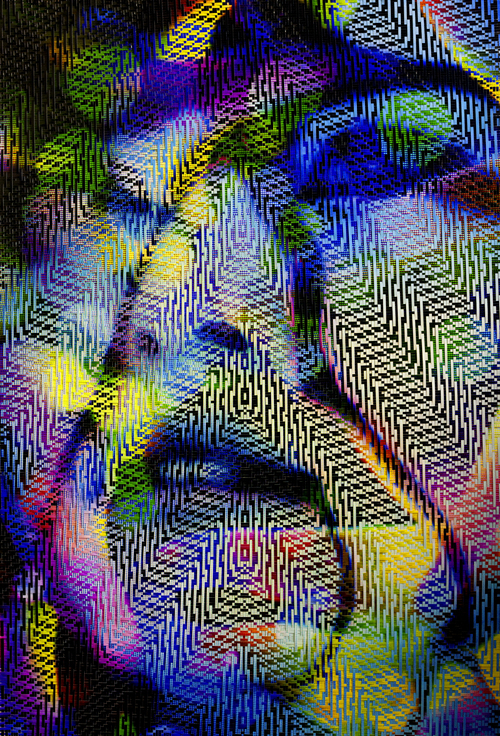 “The meta-performance “Transfiguration” is a long term meditation on the binary nature of the current human condition; where one may feel more connected than ever to the world and it’s inhabitants via the internet and the technology it has afforded us, yet feel a disconnect with physical nature and manual action. With my work I put countless hours into one piece and ultimately I do this alone. It is a transcendental experience for me. I set intentions and work through my past and present turmoils. I put a lot of energy into my work that I do hope comes off visually but in a greater sense I wish to come across metaphysically. The greatest thing I experience when sharing my work is the transfer of all of this energy to certain people who view it. When they can feel what I have put into it, I believe I have succeeded in some small way. The imagery in my work has explored the parallels and disconnects between the virtual/ digital world and the tactile/ physical world– so this project is an extension of that concept. Having been born into the dawn of the digital era, I experienced a great shift in how we view ourselves because of the influence of social media. Social media has afforded me the ability to share my work to the whole world. It has connected me to countless people and experiences that have changed my own personal reality drastically. However, I have also experienced a greater aloneness with all of this connection- and that is what Transfiguration examines.